A guest post by Shane Odom, Mythical Designs. Down through the “centuries of the snow white world”, masks have been used for revels and rituals of all sorts. Masking is always a transformative act, whether it be children cavorting at Halloween or for an ancient ceremony among indigenous cultures. Masking does more than just cover the face and provide an altered appearance. When the archetype of the mask is clear to both performer and audience, the metaphors and meaning are accessible, then an act of sacred theater occurs. It is an exchange of ideas between the masked person and the viewer. Masks are a form of story telling within themselves. By evoking imagery either of localized cultures, or from the greater depths of the human psyche, the masks provides everyone a doorway into the story, removing the human form and substituting a metaphor in their place. The art of Christmas Mumming and Revels has a long tradition with masks. The various small plays and pantomimes that are enacted this time of year in European and other cultures are rich with them. The Christmas Revels in particular have used masks since the early days. In the props archives of the many Revels troupes around the country there are numerous examples of fierce dragons, barnyard animals, and dancing fools with grotesque features, all telling some small part of the solstice story. 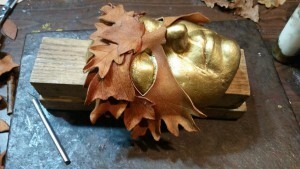 Masks are playing a special part in this year’s Washington, D.C., Christmas Revels. My wife and I are full time professional mask makers. We are honored to be part of the production, as maskers, and I as a principal performer in the role of the King. The initial offer to participate wasn’t directly about our mask work, but our artistic careers are rather entangled, and we immediately offered our craft to the show. It is a monumental undertaking reflective of the ambitions that Revels reaches for every year. Dozens of our pieces will be in the show on chorus and principals, and examples of many will be available in the show’s gift shop. Without spilling too much of the magic, a mysterious woodland queen and her court might need masks to veil their true nature, or perhaps the masks are actually that, and the true mask is the human face we find most familiar? 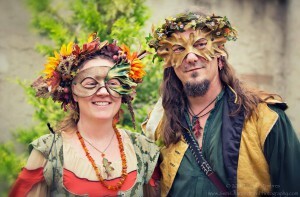 Faery glamour can be like that. Either one, masks were needed. So we thought to share a glimpse of our creation process. We work almost exclusively in leather and paint, ornamenting sometimes with glass or semi-precious beads. Our work is very sculptural and textural, reflecting our backgrounds in similar arts. We start with vegetable-tanned cowhides, and the first step, but an important one to us, is a hand-applied texture. We suede each hide, using wire brushes, to give a heavy nap to the surface. This is done to provide a depth to the finished piece that amplifies our dry brushing paint techniques. As so many of our works are nature- and leaf-inspired we often gather leaves directly in autumn for patterns. We joke about it, saying we don’t work that hard and that Mother Nature makes the patterns, but really it’s all in good humor. It’s taken years of experience to find the right leaves and the forms we like as well as how to alter them to work in leather. Additionally, the paint finishes while inspired by leaves in autumn’s glory, feathers of an owl, or a butterfly’s wing are carefully thought out and detailed in surprising ways. Still it is a joy to work in partnership with the environment this way. To say that we are “working” when walking in the woods and observing the natural world is perhaps one of the greatest benefits of our craft and art. When the design and pattern templates are ready, we trace them onto the prepared leather. 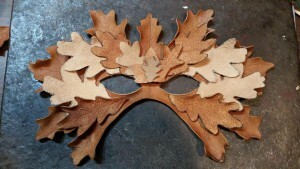 The masks are cut out and soaked in a white glue-based stiffener. This is necessary as we work in “split” leather which has had its tooling surface removed, allowing us to achieve the textured surface we prefer. The saturated “flat” is removed and dried for a short time on fans. The consistency is akin to clay, which, considering that potters use the term “leather hard,” seems appropriate. At this point the glue has not fully cured, and the leather is malleable and holds the form it is placed in. That form is achieved in several ways. 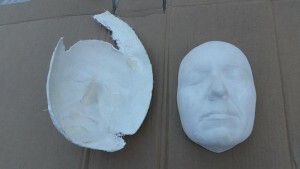 We don’t use any molds, but we do use a face casting. We are lucky in that my wife’s face has naturally symmetrical and “classical” features. In the early days of our careers we took many measurements and did considerable research on human features and we were delighted to discover that her face casting would fit an incredibly wide range of faces. The vast bulk of our work is done on a series of castings of her face and they fit from the very young and small to the very large, very well. However, occasionally, specifically for performers, we find that a custom casting will be in order. This was the case for this year’s Revels and the Woodland Queen, played by Gwen Grastorf. 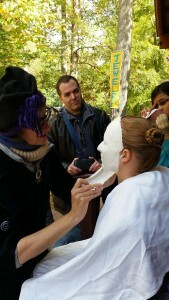 The mold is done with plaster bandages, such as is used for medical casts of limbs, directly on the face. Once set, it is easily removed and ready for casting. This is then filled with mix of hydrostone cement. A solid positive is achieved and this we traditionally spray in a high-gloss gold to preserve the surface and provide us a working form. We only need the shape of the nose bridge, brows, and cheekbones, but a full face casting is usually in order for posterity. Having face form ready, we do initial scribing and sculpting of leaves, etc., in the flat and then lay the flat over the face, working it down onto the features. Careful attention is paid around the eyes and mouth to make sure a range of motion is maintained. 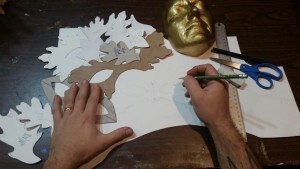 Any additional sculptural attachments are glued on as we make the mask and the form is placed aside to set up. Once it will hold its shape, we check it again for fit and comfort on our faces. Then it’s removed from the form and dried on fans overnight. The next step is, in many ways our favorite, the painting. We are primarily painters and are both trained as faux finishers. We bring all of that to our studio bench and more. We work in artist-grade acrylics. 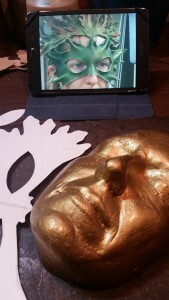 The mask is base coated in usually only one of three colors, green, white, or black, depending on our desired finish. Then begins the process of building up layers of color. We often work in the technique known as “dry brushing” using brushes dried of most of their paint. This lays highlights that are then built up, bringing out details. We achieve iridescent and shimmer effects using “interference” paints. These have tiny flecks of titanium coated mica as a pigment base. These refract light in different wavelengths and, when mixed with standard colors, create amazing fantasy elements. Once the painting process is done, it dries overnight on fans again, to cure the paint. Then they are signed, and a final coating of clear sealant is applied to protect the finish. That’s it. You’re ready for Revelry. Care is simple. We encourage our prospective mummers to hang their masks by two points to preserve the shape, not leave it in direct sunlight for extended days, and not crush it or deform it. Other than that, the masks are durable, wearable and usable. Some of our masks see very hard wear and use. Performers wear our work while juggling fire, acting on stage and street, singing, celebrating and performing foolery, in all kinds of weather. They don’t like an oversoaking, but some rain, sweat, or moisture doesn’t harm mask or finish. Like a pair of shoes they tend to get more comfortable with wear. 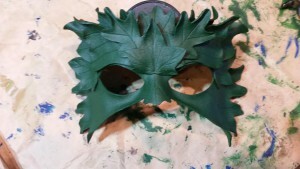 For the Christmas Revels this year we created several unique designs for stage and sales: the Woodland Queen’s mask and crowns, custom-designed, as well as the matching crown and mask of the Green King. The Woodland Court wears four designs, inspired by the elemental powers of their people. Editions of these, along with the snowflakes as worn by the snowdrop children, will be available at the merchandise table for the shows. We also created matching accessories and Christmas ornaments reflecting the ivy and oak themes of the story as well as some unique editions of our wintry themes. Masking as an art form and career is a strange and fascinating path in life. It is all imagination, and fable and “Faery Glamour.” Yet it is very real in the emotions it evokes in people. We have seen people moved to tears by the imagery we’ve created, but their feelings are really for that of the natural world. It is like giving voice to story and sight to trees. It is a type of magic, to reach back into the depths of time, bring up forms that excite the imagination and spirit, and give real meaning through them. It is an honor and a responsibility. These are people’s dreams we are touching, and those are special indeed.